Dot Grid 3.5 X 5.5 Notebook Recommendations? I recently purchased a "traveler's notebook" (in quotes and not capitalized because it's not Traveler's brand... is there an accepted way to refer to these when they're not made by Midori or Traveler's Company?) that takes 3.5 x 5.5 inch notebooks. I have a Clairefontaine in there (which is spectacular) but I'd REALLY love some dot grid paper. 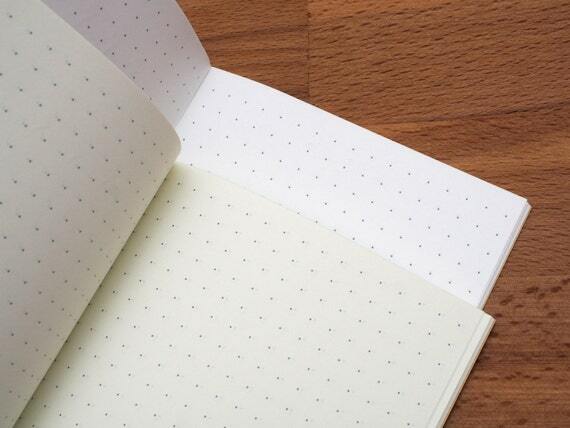 Does anyone have any recommendations for a fountain pen friendly, dot grid, 3.5 x 5.5 inch notebook with a soft cover? Staples vs stitched binding doesn't matter to me but I don't want glue and I'd like it to be relatively small - the Clairefontaine has 48 pages. Thanks in advance paper gurus! I didn't know Goulet made 3.5 x 5.5! Thanks LizEF! You're welcome. I have the one with the heavier Tomoe River paper and love it. Or I should say: Ink loves it. Several of the Fieldnotes have 70lb paper. You'll have to check to be certain. They are themed notebooks so you may or may not like the covers. Write notebooks also makes very nice FP friendly NBs but the binding is different and may not work in your Traveler type cover. Bandiapple notebooks have great paper. Goulet use to sell them. They are made in Korea so you may need more internet searching. I know several people make large orders from them but I don't have a link. but if you are game enough, its pretty do-able. Nock Co. might have something that will work: nockco.com. Edited by jimhughes, 16 May 2017 - 22:04.